Chrysanthemum ×superbum of Michigan Flora. This is a well-known horticultural plant, presumed to be a hybrid between two European species; quite variable, with numerous cultivars. First collected outside of cultivation in Emmet Co., in 1948. 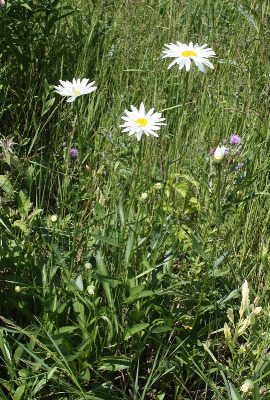 The heads are similar to those of the weedy ox-eye daisy, but they run larger and the leaves are merely toothed rather than lobed and well developed toward the middle of the stem (rather than toward the base). MICHIGAN FLORA ONLINE. A. A. Reznicek, E. G. Voss, & B. S. Walters. February 2011. University of Michigan. Web. 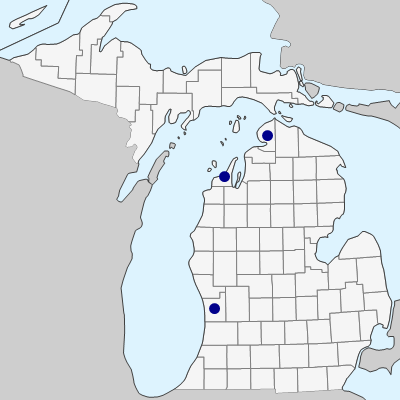 April 21, 2019. https://michiganflora.net/species.aspx?id=394.